Superman 2.0: How human-enhancement technologies are giving us all superpowers. Technology is starting to give us superpowers once reserved for comic-book heroes. 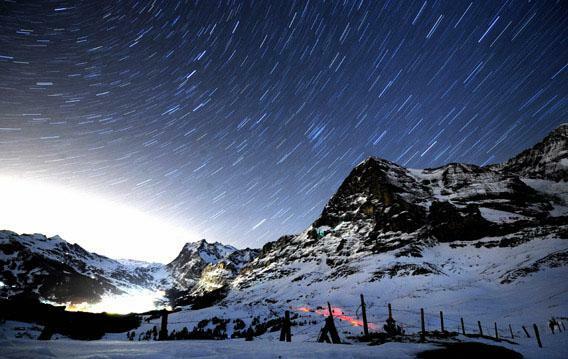 A long night exposure of one of Switzerland’s most notable mountains, Eiger Peak, in the Bernese Alps. In the summer of 1935, a pair of Bavarian climbers arrived in the Bernese Alps, hoping to become the first people ever to scale the monstrous north face of the mountain known as the Eiger. On their first day, they made good progress. On the second day, less so, and on the third, even less. Then a storm swept over the mountain and they froze to death. The next year, four more mountaineers attempted the face, and all four died. After a third failed attempt in 1937, a quartet of climbers finally reached the summit in 1938, taking three days to get there. Twelve years and many more fatalities later, a pair of climbers managed to surmount the Eiger in 18 hours. The 1960s saw the first successful solo climb. In 1988, Alison Hargreaves climbed the Eiger while six months pregnant. By the 1990s, people were making the climb in the dead of winter. In 2008, Swiss climber Euli Steck speed-climbed the peak, solo, in winter, in 2 hours, 47 minutes, and 33 seconds. You can watch the video. Last month, a trio of Brits stood on a ledge near the top of the Eiger, then spread their arms and legs like wings and flew down. The Eiger hasn’t gotten any shorter or less steep, nor the conditions any gentler. Rather, humans have grown stronger, more skilled, and better equipped. The relative ease of scaling the Eiger today is the result partly of a series of portable and wearable technologies—ultralight synthetic fabrics, custom crampons—that have turned human climbers into superhuman climbing (and flying) machines. But lest you think it’s all in the tools, American Dean Potter ascended the face in 2008 with his bare hands. Granted, the ability to climb an Alp in less than three hours isn’t a particularly dramatic superpower by comic-book standards. It’s not like anyone’s leaping to the summit in a single bound. But if Marvel and DC Comics have conditioned us to think of superhuman abilities as freakish and far-fetched, science and history are teaching us otherwise. It turns out we don’t need genetic mutations, lightning strikes, or laboratory experiments gone awry to produce people with extraordinary physical and mental capabilities. Human enhancement is happening all the time, largely through incremental improvements on existing technologies. And contrary to those who would have you believe that the golden era of innovation is behind us, the rate of this progress shows no signs of slowing. It just doesn’t always follow the paths that the experts predict. Ten years ago, Slate editor David Plotz wrote a series of stories examining the ways in which scientists believed humans could better their vision, strength, memory, alertness, and hearing, primarily through drugs or surgery. His “Superman” series examined emerging technologies ranging from retinal implants and prosthetic ears to gene therapies and memory drugs. Today, many of those possibilities remain frustratingly just over the horizon. In some cases, we’re hardly any closer to realizing them than we were in 2003. And some technologies that were newly available then, like the alertness drug modafinil, have grown in popularity even as they’ve proved less revolutionary than their most ardent supporters (and critics) had hoped or feared. In the meantime, a new crop of enhancement technologies has captured the attention of the media, the dollars of investors, and the scrutiny of ethicists. Some of the potentially most transformative achieve their effects not through biochemistry but by means of electronic devices that connect our brains to external sources of knowledge, sensory data, or physical power. We may not have gotten any closer to being able to put memory chips in our brains, but who needs those when we’re all walking around with the entire contents of the global Internet in our pockets—or on our faces? The story of the Eiger reminds us that wearable technology isn’t an entirely new trend. But it’s taking off today in more ways than you might think. Muscle suits, long elusive, are starting to look more plausible, at least for specific purposes such as lifting a hospital patient out of bed. The military is working on “Spider-Man suits” that let the wearer scale vertical walls. We may never get our hoverboards, but jetpacks are already starting to give certain daredevils a superpower that humans have coveted since Icarus. But perhaps the most astounding enhancement technologies that have begun to enter the realm of reality in recent years are devices that interact directly with the human brain. Products now on the market can use things like your skin conductance, facial expressions, and perhaps even brain waves to detect your emotions and intentions, albeit crudely. In the medical realm, cochlear implants can restore some hearing to the deaf. Future neural implants could allow humans to manipulate real-world objects with their minds—a power some have likened to telekinesis. Incredibly, this may already be happening. In North Carolina in 2008, researchers got a monkey thinking hard about walking—and in Japan, a pair of robotic legs began to do just that, controlled by the monkey’s brain activity via the Internet. And last December, a quadriplegic woman in Pittsburgh used electrodes implanted in her motor cortex to feed herself chocolate with a robotic arm. Drugs aimed at cognitive enhancement so far have achieved nothing so breathtaking. Yet surprises have come in that realm as well. If modafinil has generated less controversy over the past decade than we might have anticipated, ADHD medications have sparked more. Adderall blurs the line between therapy and enhancement, boosting the mental energy of people who haven’t been diagnosed with ADHD as well as sharpening the focus of those who do. Does that make it dangerous—or marvelous? Should biological enhancements be restricted to those who suffer from diagnosable diseases or disabilities, or available to all? What about when we finally make the breakthroughs that allow for more invasive and irreversible enhancements, like gene therapies, or even genetic engineering of human embryos? As with Plotz’s Superman series a decade ago, this series will explore concrete examples of technologies that are already pushing the natural limits of human capacities. The focus will be less on their moral dimensions than on their practical strengths, limitations, and potential to alter the human condition. While it’s great to debate the ethics of human enhancement, it’s at least as important to understand just what it is we’re arguing about. We’ve conquered the Eiger. What impossible peaks will we conquer next? Your Other Brain: We’re outsourcing more and more of our memory to the Internet. Will we regret it? The Force Is With You: Thanks to “brain-computer interfaces,” you can finally move things with a thought. My Sixth Sense: Amateur biohackers are putting technology inside their bodies to give themselves incredible abilities. Steel Yourself: Could a robotic exoskeleton turn you into a real-life Iron Man? The Myth of the Superbaby: Can China really breed a crop of genetically selected geniuses? The New Stimulus Package: Overachievers are popping Adderall to get ahead. Is that a good idea? Superhero or Supervillain? : If science gives people superpowers, will they use them for good or evil? You Are Already Enhanced: Everyday technologies give us superpowers that would make our ancestors wonder if we’re entirely human.